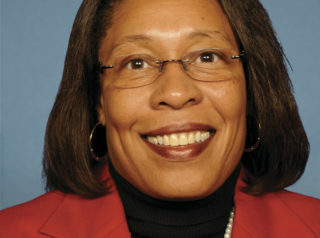 Marcia L. Fudge was born on October 29, 1952 in Cleveland, Ohio. She earned a BS in Business Administration from Ohio State University in 1975, and a JD from the Cleveland Marshall College of Law in 1983. Prior to entering politics, she worked variously as a law clerk, an attorney, an auditor for the Cuyahoga County (Ohio) Estate Tax Department, and a director of that same county’s Personal Property Tax Department. Fudge served as chief-of-staff for U.S. Representative Stephanie Tubbs Jones (Democrat, Ohio) from 1999-2001, and as mayor of Warrensville Heights—a mostly African-American suburb of Cleveland—from January 2000 until November 18, 2008. On that latter date, Fudge won a special congressional election to fill the vacancy created by the recent death of Rep. Tubbs Jones, and she has held that seat ever since. Fudge is a member of both the Congressional Black Caucus (which she chaired from 2013-15) and the Congressional Progressive Caucus. On NBC’s Meet the Press in July 2013, Fudge denounced the Florida jury that rendered “not guilty” verdicts on murder and manslaughter charges against George Zimmerman, a “white Hispanic” who in February 2012 had shot and killed black teenager Trayvon Martin in a case that made national headlines. Characterizing Zimmerman’s acquittal as evidence that blacks in the United States “are being attacked from so many sides,” Fudge called for “a broader discussion … [about] how we are treating minority people in this country.” As further evidence of racial injustice, the congresswoman cited also the recent Supreme Court decision that she said had “gutted” the 1965 Voting Rights Act (VRA). In reality, the 2013 Court ruling merely struck down, as anachronistic, a VRA provision requiring mainly Southern states to undergo—based on the presumption of their continuing racist tendencies—special federal scrutiny before being permitted to change their election laws in any way (e.g., by instituting Voter ID requirements or reconfiguring their voting districts). After Debbie Wasserman Schultz announced in July 2018 that she planned to step down from her post as chair of the Democratic National Committee, Fudge was named as the permanent chair of the Democratic National Convention which was slated to take place in Philadelphia during July 25-28. Asserting that one vital role of government is to “lift people out of poverty,” Fudge favors a steeply progressive income-tax structure as a mechanism for wealth redistribution. For an overview of Fudge’s voting record on a wide array of key issues, click here. Further Reading: “Marcia Fudge” (Votesmart.org, Ballotpedia.org, LinkedIn.com); “Enough Already with the Race Card” (by Deroy Murdock, re: Republican comments about Susan Rice, 11-30-2012); “Congressional Black Caucus Chair Fudge: ‘We Are Being Attacked from So Many Sides” (Breitbart.com, re: Trayvon Martin & the VRA, 7-21-2013); “Black Congresswoman: Decision Not to Indict Darren Wilson Was a ‘Slap in Our Face’” (RawStory.com, 12-2-2014); “Congressional Black Caucus Chair: Dems Lost Midterms Because of Racist White Southerners” (Breitbart.com, 11-12-2014); “Fudge Calls GOP Colleagues ‘Evil’ and ‘Nuts’” (Cleveland Plain Dealer, 1-18-2013); “Fudge Once Wrote Letter of Support for Stabbing Suspect” (Associated Press, 11-20-2018); “Who Is DNC Chair Marcia Fudge?” (NBC News, 7-25-2016).